Because I have a big shoe box of untried nail polishes I was looking for a fun way how to empty this box (if it could ever be emptied =)). 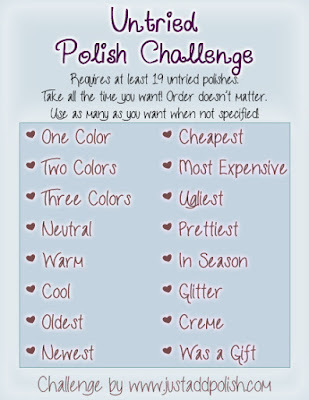 After searching the web I found Untried Polish Challenge that was created by Jonochi from Just Add Polish! I can' wait for "harder" parts of this challenge, because the first part of the challenge is super easy (just like a warm up). I decided to do this challenge of Fridays. To add more fun to the first part of this challenge I decided to draw a nail polish from the bottom with my eyes closed. I draw Gabrini Summer Edition M117 (what a wonderful name?). Reddish pink with pink shimmer. I applied 2 coats no top coat, it dried pretty fast. Do you have a lot of untried nail polishes? Would you join this challenge? This is a great idea. I lost count of how many untrieds I have. I'll do this challenge more than once. I had the same problem with collecting my untried nail polishes in a box. For some I really had no clue if I used them already or not =). 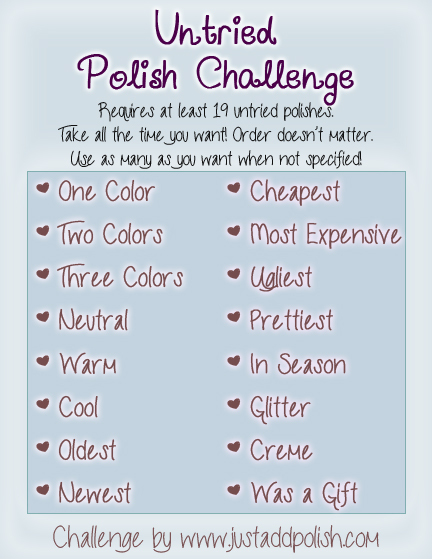 I hope you enjoy this challenge =). Jaz nekatere vedno nazaj vračam, in imam nekatere že po 4 leta, pa jih še nisem uporabila (vem, sram me je lahko) =(.